Three Good Rats: A Cause for Great Excitement! A sleeve has been completed and joined to the body. Behold! I realize it doesn't look like much right now, all squished up and misshapen like a fourth-grader's art project. I've only made a couple of sweaters with this sort of bottom-up yoked construction, and each time I have a moment upon joining the sleeves where I become convinced that I've made a horrible mistake and the sleeves will be jutting out from somewhere along the bottom part of my ribcage. But it is not so. It is simply an awkward stage, much like adolescence, in which everything is just a bit twisted and out of proportion and you must just endure it until it is outgrown. 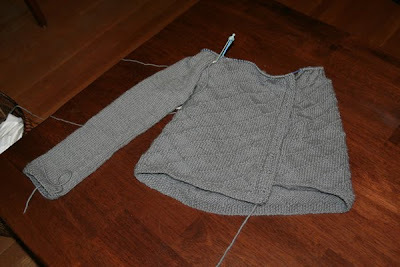 As I progress up the yoke, it will all come together neatly, and the result will be a lovely sweater with sleeves where my arms are and a hole where my head is. Magic! How can you even *think* about sweaters in this weather, let alone make one? If I wait until sweater weather to start, it won't be done until it's too warm again to wear it!